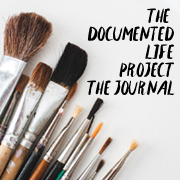 Journal Prompt: What Makes Your Heart Sing? You know what makes my heart sing? 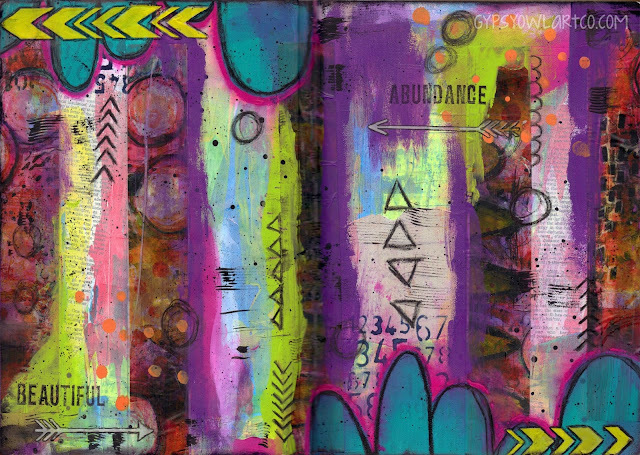 Bright colors, lots of layers, funky scribbles, circles, dots, and arrows. That's what makes my heart really sing... artistically anyway. This week's art challenge was Digital Imagery & Design. I "cheated" a little bit with that. Not being one who scans my own art into a computer... though I'm working on doing that now... I used an Art Page by Crowabout StudioB (mischiefcircus.com) from her La Vie Boheme collection that I had purchased a while back. My computer at work is odd... when printing photos it prints them in "strips" with white space in between. In order to get a full normal picture you have to print it as a document. It's weird. Anyway, I had printed the art page as a photo and just brought it home to use as collage at some point in time. So that's where my "digital" comes in. This was a digital paper that I printed. Then this challenge happened. I'm still in "photo transfer" mode... trying out all the different ways to do so and I actually used the strips to do a packing tape transfer. I was pleasantly surprised by how well it worked. You can tell that I didn't get the tape just right in places but you know me, I love it when there are imperfections! I used various stencils including Array of Arrows (Americana) and Number Jumble (Dylusions) and my own. I used book text and an old ledger page (scrapbook paper) from my stash for collage. My Stabilo All pencil for scribbles and doodles, DecoArt Media Modeling Paste through the arrows (love that stuff), and a stamp set by 7Gypsies for the words "Beautiful Abundance" with black archival ink. But what did I use for paint? My brand new Dylusions paint!!! The picture is good but it still really doesn't do it justice... this paint is so vibrant! I think I definitely have a competition between favorite turquoise paints... the Dylusions or the Dina Wakley. Love both. It's a good thing they are different shades! Well that's my page for this week! I managed to get it finished by Tuesday and even had time for a catch up page (Week 18)! I'm off to get ready for a long weekend of work. Y'all have a great weekend! Yep colour makes my heart sing too!! You have stunning mash of gorgeous colours! Like a crow I just had to click and see your yummy sparkly happy art!! Love it so much!! Thank you so much Giggles! What a lovely thing to say!!! Great interpretation of the DLP prompt! I am having difficulty with this month's theme as i don't really do digital art at all...but guess it's good to go beyond my comfort zone. Well done you! Aww thank you Dianne! Digital isn't my thing either. However, getting beyond the comfort zone is always a good thing! Color dream are made from! Such coolness on these pages!